All 31 entries tagged Wider-World, Innovating Research! 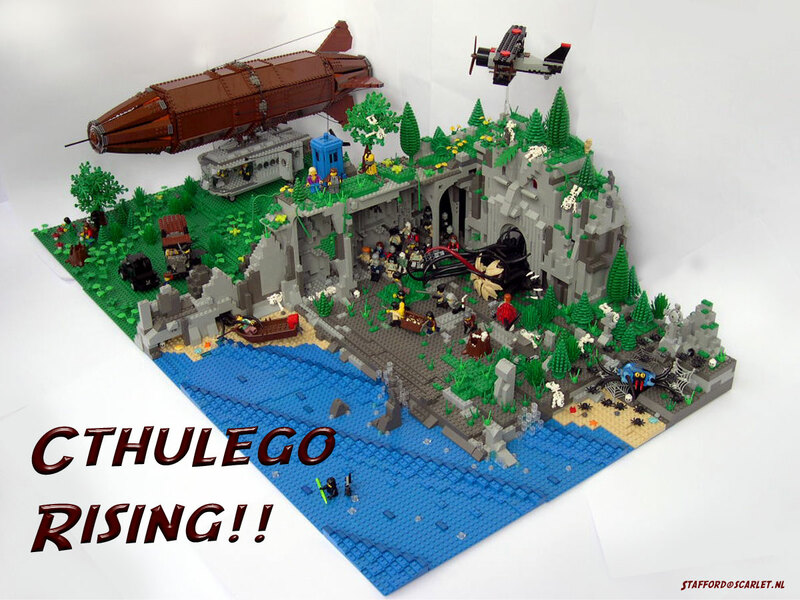 Great Cthulhu – in Lego? Are librarians the most stressed out profession? Hmn, not sure if I'd agree with the precepts of this report – being a librarian is anything BUT monotonous. In fact a bit of monotony every now and again might make a nice change from the constant, erm, change. Could this be a sign of the future for library stock location? I guess it'll come down to how soon and how cheap! Follow-up to CILIP Review of Special Interest Groups from Innovating Research! Well it seems that at last week's CILIP Council meeting the proposal to merger of various groups (including CoFHE, UCR and ELG) into a new entities was rejected for the time being. What it looks like will have to happen with be that the future of the Special Interest Groups will now be put to the general membership to decide. This will be somewhat interesting considering that only 11% of the membership replied to initial consultation – you've just got to hope that this time more people make their voice heard on this somewhat rather important issue. I think I conveyed how well blogs are being used here at Warwick in a more professional sense, though as a lot of the people there were attending from corporate or public library services there was a lot of concern over the need to censor/control what was published. Not so free and easy as we have it here in academia. I also learned a fair bit from the other speaker on such topics as RSS, blog-directories and will be using the terms cat-blog and boss-blog far more (though I maintain my personal blog elsewhere remains a goose blog!). Anyway fun aside it's time to turn to some 'proper' work for a while – I've a sickening feeling that means more analysis of reading list data and less thinking about blogs for a bit. At least until Wednesday when I'm on a panel discussion at a conference on Exploiting new social media applications talking about such things again with some fairly heavy weight speakers. Or more accurately CILIP's guidance on the recent bills which propose giving police and security services the rights to scrutinise borrowing records or internet sites visited by particular individuals. As featured in last Tuesday's education Guardian this is an area of concern for librarians across the country who might have ethical dilemmas with it. Thankfully CILIP has obtained legal advice on the issue, reproduced in their press release I've linked to – that's probably well worth a read by all library staff. Spent yesterday travelling all the way up to Newcastle for the National UC&RG committee meeting. Rather a long day as travelling up from Loughborough is hardly the most direct of routes. Surprisingly Newcastle was far warmer than Loughborough! A good (if long – one day we'll have less than a 4+ hour one) meeting for which I mostly able to write up the minutes on the train ride back. One advantage I guess of long journeys. The good news is that the Library Futures event that's being hosted at Aston University in the next few weeks may well be repeated in the new year – such has been the demand to attend. Naturally, this will all depend on the speakers agreeing to take part again (or replacements if they aren't). There was also a fair amount of discussion on the SIG review, and contrasted with CoFHE I believe the UCR are taking a far more positive approach to the whole exercise and no matter what the outcome really want to do the best for our membership. Also heard an update on the 2006, 7 and 8 conferences which are shaping up nicely – just hope I get the chance to attend, as the UEA hosted on next year looks like being real fun – though not 100% convinced by the chill out zones! Am I attending a conference or a festival? What a clumsy title. Anyway, I've been putting off starting this for a while. I've been booked to speak at two conference towards the end of the months on librarians and blogging. One's a more formal presentation on their pros, cons, uses etc in a LIS workplace setting, whilst the other is a discussion panel with me, the Guardian and Nokia all setting out our vision for exploiting such social media collaborative tools for a lot of men in suits. While for the latter there's a handy conference wiki(1) for me to collect my thoughts, but for the other one I guess it's going to be the old ppt slide and entertaining talk. Thankfully having spoken with folks in eLab, the comms office and our very own Learning Grid I've got some ideas where my talk might go – but how do I tell a bunch of librarians "Don't write dull blogs" in a polite manner? I'm part of a Google group of librarian bloggers and I have to say I've not been that impressed (or indeed stimulated) by the stylistic approach that a lot of them take. Librarians do seem to have a problem with making themselves interesting when they write (I'm only a librarian by trade rather than calling, so hopefully I've got a slightly punchier style). sigh So if anyone has any stunning suggestions that I can expound to them with a maniacal, but professional, glint in my eye, let me know. So what would you say was the wealthiest region of the country? Probably the South-East. So which region do you think would be best equipped to buy new digital receivers for when the government turns off the analogue signal – probably one and the same right? So interesting that according to this plan the South-East will be the last region to get it, and the rest of the country has to fork out first! Bah! On the other hand Tyneside also appears to be in there at the end – not quite sure how that fits into my equation.